So close to the weekend that I can almost feel it! Dare I say the weather is actually on our side too?! High of 72 today and 72/75 this weekend...hooray! You can guarantee that I will be outside for most of it. 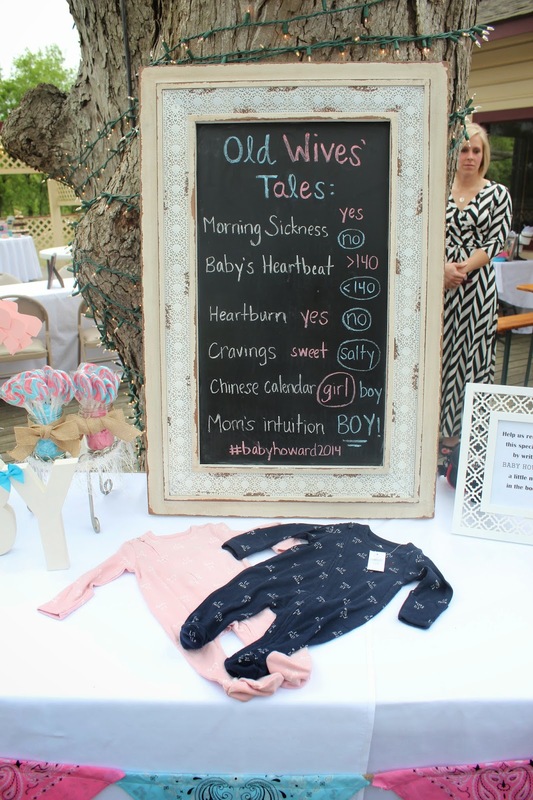 I know that Steph did the recap of her gender reveal party (read here) so I'm going to keep this short and sweet, but I thought it would be fun coming from a different perspective and that I could list some of the sources/inspiration for the party in case any of you will be planning a gender reveal party in the future. You never know! I was lucky enough to be included in planning this party with two of her best friends, Ashley and Brooke, at a local winery. +I bought 4 cardboard letters from Hobby Lobby (they were only $2) and painted them all white. Once they were dry, I glued some blue and pink bows (also from Hobby Lobby) in the corners for an easy tabletop decoration! +Bought them from Big Dot of Happiness! 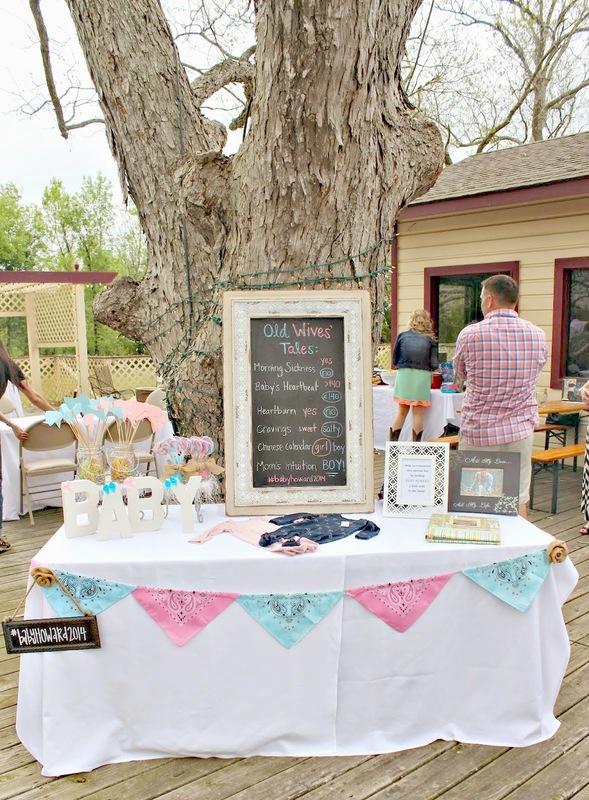 They have anything you could ever want or need for a baby shower or party like this. +Blue and pink tissue paper was stuffed down in the mason jars to "hold" the suckers up and tied burlap bows on the front. These were so easy and turned out really cute! 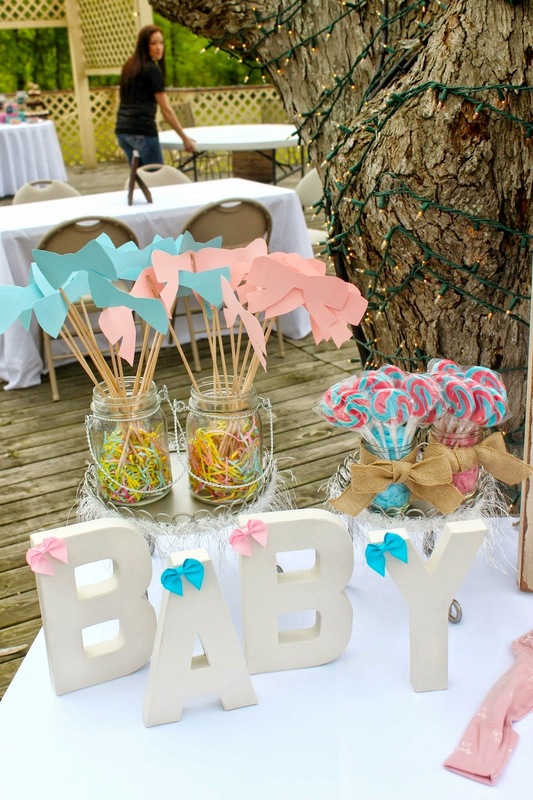 These can also be used as a cute photo op with your friends and family to symbolize their "guess" of the baby. They are also great because they added some height to the table. +I just googled bow and bowtie images, printed them out, and used pink and blue cardstock to cut them out (about 15 of each). Then, I bought one pack of the long wooden sticks (from Hobby Lobby) to glue on the back of them. To finish them off, we just placed them in mason jars with fun paper! I wanted to add something that had a more personal touch and came across the idea on Pinterest (what else?) for a memory book, and knew right away it was what I was looking for. I bought this baby scrapbook from Hobby Lobby and filled it with blue and pink card stock paper, with a note in a frame next to it for people to leave a special note to the parents and/or baby. I love that they can keep this and put it in her nursery! We used these tall glass mason jars and filled them with blue and pink candies (from Party City) and put cute mason jar labels around the top with their name choices. Guests could take home some of the candy using plastic scoops and small plastic bags! There was also cupcakes, cookies, and some other bowls with candy spread out on the table that Ashley and Brooke did an amazing job on. And as most of you know by now...baby Howard is a GIRL!! To the Mommy to be-I'm so glad I got to be there when you found out you will be bringing beautiful miss Paisley into the world! I wouldn't have had it any other way, and feel so lucky that I was able to meet all of your friends and family that you've known for years. They made me feel like "one" of them, which I'm so thankful for. I absolutely cannot wait to be an aunt, to support Paisley in every way I can, and to continue this journey by your side! Love you! This made my heart smile. Specifically the note at the bottom. THank you thank you thank you for all your time and work on this party!! IT MEANS SO MUCH TO US!!! And it means even more to me that you came all the way down to the T.X. to be such a huge part of it!! And one last time...YOU WERE SO RIGHT! Love you sister pants. This is a fabulous party! So much attention to detail! Where did you get the jars for the candy? Must get some for Ford's first bday! So adorable! I love the memory book idea! 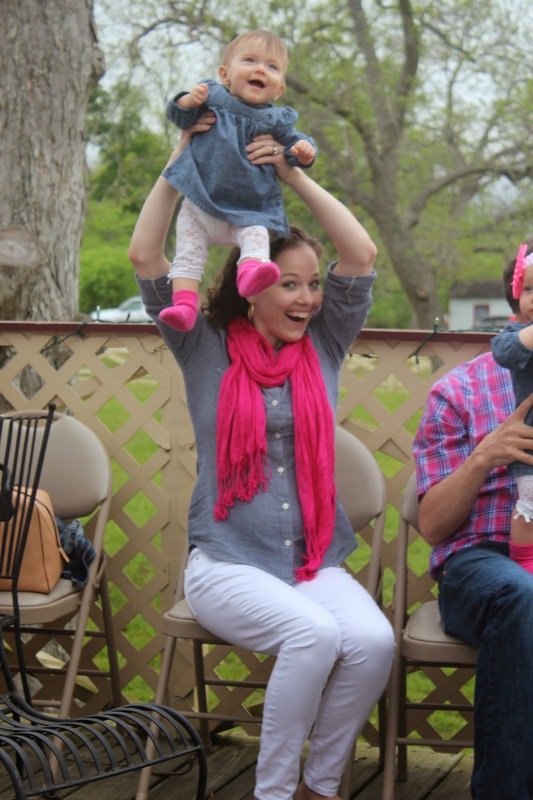 Gender reveal parties are so fun! Congrats to the momma to be! You all did an amazing job on Baby Paisleys Reveal!!! this one definitely goes down in the books (: All the details are so creative and cute!! PERFECT!!! This party was absolutely adorble and so perfectly done. It was SO fun checking instagram constantly this day!!! I love everything about the attention to detail and all the rustic feel to it! So perfect :) You girls did great!! I love all of the details and it looks like it was such a fun day. I was checking IG all day waiting for the big reveal. 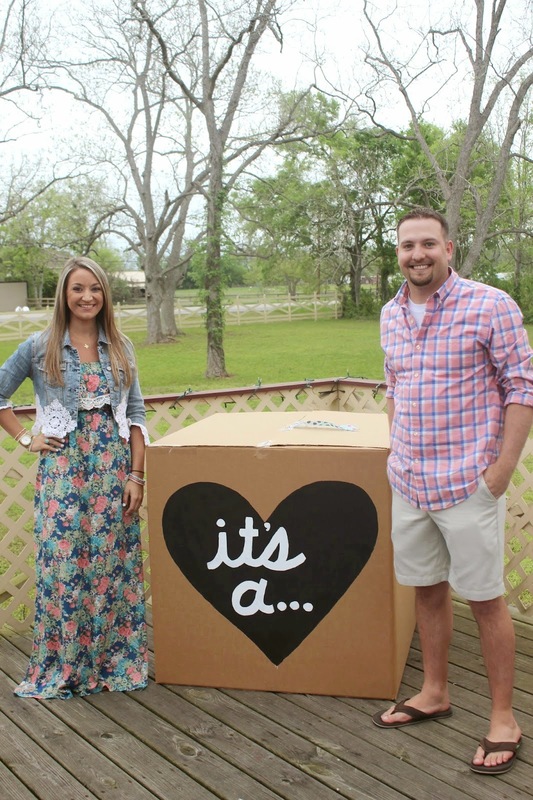 This was absolutely the CUTEST reveal I have ever seen! It even got the attention of my fiance who piped in and said we MUST have a reveal when and if we get pregnant again. I told him to hold his breath (and keep it in his pants) LOL :) PS- your friend is GORGEOUS! This was all precious! What a great job you girls did. Thanks to the photo of that sweets table, I now want SPK. 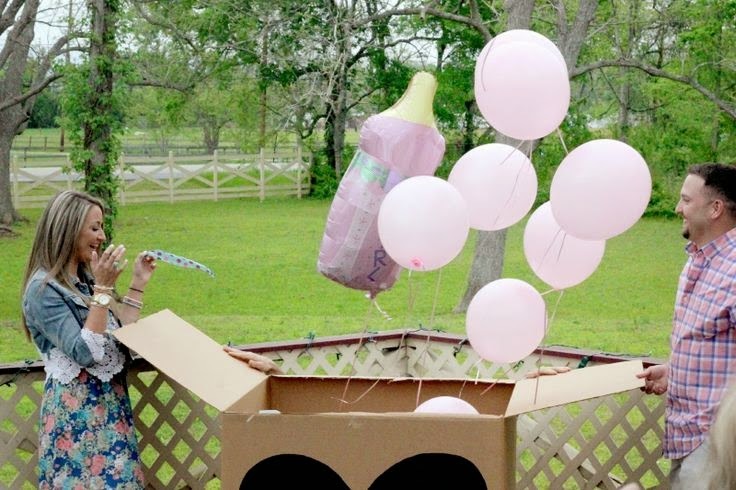 PERFECT gender reveal party. Just perfect. I was totally rooting for Paisley just because the name is so darn cute. We had so much fun following along with you guys in Vegas! So happy for Steph!! :)Yay for bloggy friendships! I absolutely loved everything about it. It was definitely perfect.